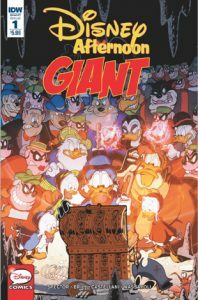 IDW has a new anthology comic sure to catch the interest of TV animation watchers — and furry fans: Disney Afternoon Giant. According to them, “It’s the first issue of a brand-new series featuring stories from your favorite Disney Afternoon shows! It’s a blast from the past in the present as we feature classic DuckTales, Chip ‘n’ Dale Rescue Rangers, and Darkwing Duck stories, all together in one place for the first time!” The first issue features stories by Warren Spector and Ian Brill, with art by Leonel Castellani, Jose Massaroli, James Silvani, Jake Myler, and Braden Lamb. Fans of the Ursa Major Award-winning rebooted DuckTales TV series (and they are myriad!) have a new resource at paw, thanks to teacher and illustrator Zack Giallongo. His new book is called DuckTales Doodles. “Draw, color, and create with your favorite characters from the all-new DuckTales series. Every page is packed with character doodles, from Scrooge McDuck to Webby Vanderquack. Tap into your artistic talents to bring these hilarious and exciting scenes to life! Solve a mystery and re-draw history!” It’s available now from Disney Press. We learned about this through Cartoon Brew, though it’s been turning up in multiple places. It seems that the Disney Company has produced a new animated TV series based on the 1944 Donald Duck feature The Three Caballeros. But here’s the strange thing: The new series, Legends of the Three Caballeros, is only available through the Disneylife app — and only in the Philippines to boot. From the CB article: “Frank Angones, a co-producer on the new Ducktales, further commented on his Tumblr that the show has been finished for a while, even before the new Ducktales reboot was produced. 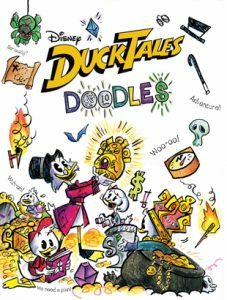 He added, ‘It feels sort of like an alternate universe rooted more in the old Donald shorts than anything Barks-related – there’s no sign of Scrooge, the nephews, Gyro, Duckburg, lots of humans everywhere, etc., with April, May, and June standing in for the kid protagonists. '” 2019 is the 75th anniversary of the original film, so folks are hoping Disney will be inspired to release this new series in other parts of the world. Would you look at that: For once, we’re not the only ones whining about cool animation we can’t see in this country! 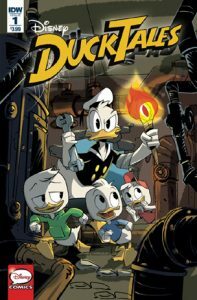 Looks as if IDW gets the honor of publishing the tie-in comic for Disney’s new DuckTales animated series. After a preview “issue #0” this last summer, the first issue of Disney DuckTales hit the shelves recently. “In ‘The Great Experiment of the Washing Machine,‘ Donald and the Nephews visit a top-secret lab, chock-full of crazy inventions to make life easier… but might make them shorter, instead! And then, learn ‘The Chilling Secret of the Lighthouse! '” The comic is written by Joe Caramagna and illustrated by Luca Usai and Gianfranco Florio. 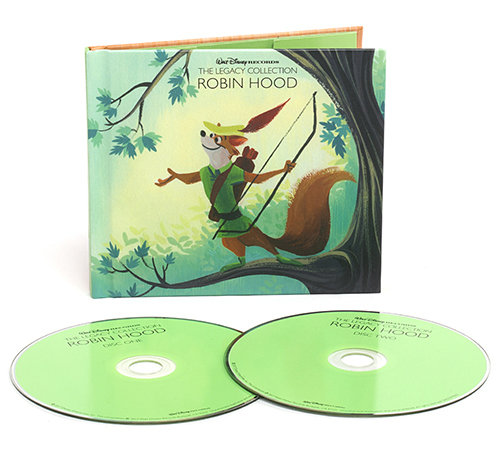 Disney has been revisiting soundtracks to their classic films in recent years through what they are titling “The Legacy Collection” series. Each volume has contained a CD of the remastered original score along with a second disc of demos, outtakes and other curious rarities that enriches the listening experience. 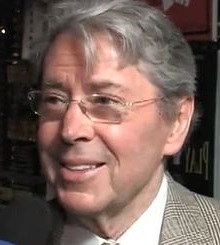 The series was kicked off in 2014 with its inaugural volume: The Lion King. Considering the Collection’s release schedule had been dormant for a couple of years it was with pleasant surprise that the series was unexpectedly revitalized earlier this month with its 13th volume: Robin Hood! Packaged in a small hardbound book with sleeves to house the CDs and generous pages of liner notes and art, this release is a winner in both content and presentation. One year ago, Zootopia, a story about anthropomorphic animals in a modern setting dealing with the issue of prejudices in society, hit theaters. 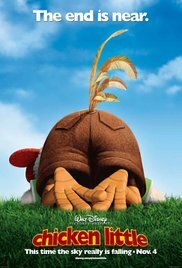 It was the most highly anticipated film for furries in the last decade, some having even rented out theaters for personal furry gatherings. In the days following Flayrah had a reviewing bonanza in which multiple prominent article writers gave their own reviews of the piece. Heck, the Fur Affinity banner changed to a Zootopia theme when the movie came out and hasn’t changed since. 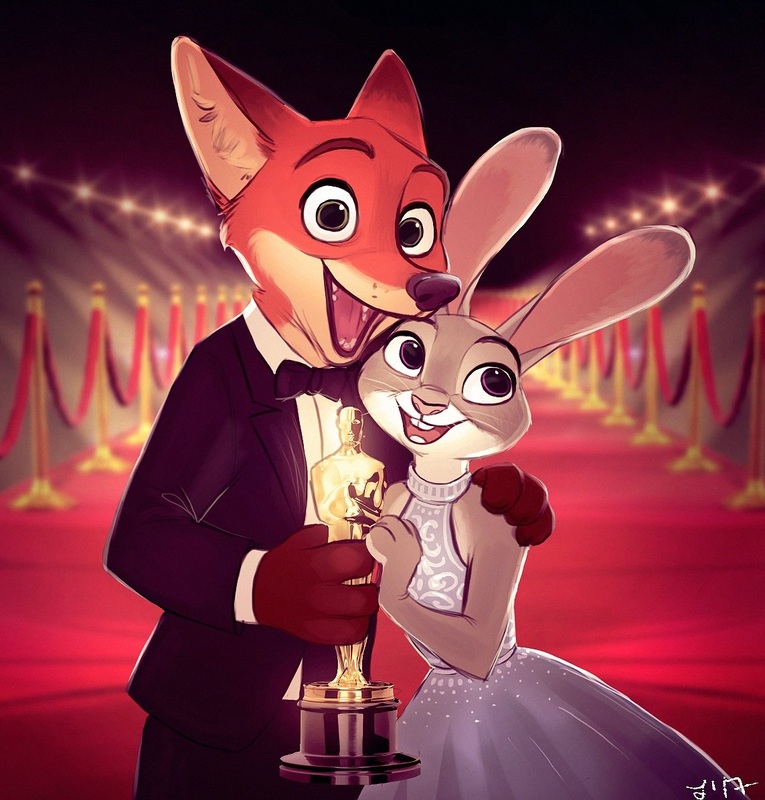 But on February 27th, the love for the film was continued to be shown well beyond the borders of furry fandom, as the academy elected it to receive the Oscar for Best Animated feature. It beat out nominees Moana, My Life as a Zucchini, The Red Turtle, and the one that most had thought could take it away from Disney, Kubo and the Two Strings. Let us not forget, Disney is a corporation. To a certain extent, we hold the 55 (and counting) full length animated movies produced by the Disney Animation Studios to a different standard than, say, the 32 (and counting) full length animated movies produced by DreamWorks Animation, or even the 16 (and counting) full length animated movies produced by Pixar, despite the fact that there really isn't much reason to, at this point. Just the fact that the brand is much older maybe should count for something, but, let's face it, just because it is so old, Snow White and the Seven Dwarfs has less in common with Zootopia than Kung Fu Panda 3 does (even when factoring out the furry aspects and the use of CGI). We still treat many of those early animated Disney movies almost like sacred texts, despite the fact that Disney never has. Disney has always treated them like what they are; products to be sold. So, you've got annual theatrical re-releases for most of last century, a practice that only died when home video became a thing. To combat that, they introduced the "Disney Vault", which basically extended the "re-release" strategy indefinitely even with home video. Then came the direct-to-video sequels; finally, when those became a bit too damaging to the brand, the live action adaptations began. And the most recent movie to get that treatment is Jungle Book. Whine all you like about originality and creativity, but Disney's got a business to run. This strategy is pretty much a brand-strengthening exercise, but at least part of the branding is based on "quality," so at least they're going to try and do right by the old movie (if not exactly Rupyard Kipling). And, hey, most of the older Disney movie's are based on properties that are public domain; if Disney doesn't do it, someone else will (and in fact, Warner Bros. has its own Jungle Book movie planned). And its not like Disney hasn't done this before (or, for that matter, that they were even the first movie studio to adapt The Jungle Book). If you want originality from Disney, go watch Zootopia again. 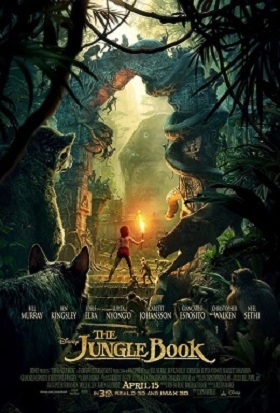 If you want to watch a good movie, well, actually, watching Zootopia again is okay, but do take some time to watch this version of The Jungle Book. It's actually really good. Who is your favorite Disney fox? Disney Animation has officially released a new trailer for one of the most anticipated furry films of 2016 (or ever)! The nearly 3 minute preview reveals much more about the Zootopia universe and its inhabitants than has been shared before, drawing from a rich diversity of species for clever puns and laughs. (The wolf segment at 1:45 is worth a playback alone.) There is also a stronger hint as to the plot details, which includes a shrewdly run polar bear crime mob. Plenty to take in here, so enjoy! This could be as much preview content as we can expect from Disney before the big premiere (March 4th). 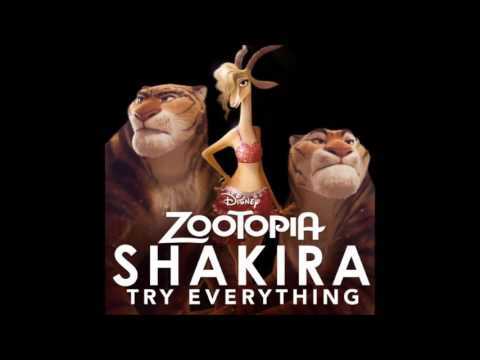 Pop star Shakira has put up a 30 second preview of "Try Everything," a song she is singing in character as Gazelle, a, well, gazelle pop star from the furry world of Zootopia (or Zootropolis to our non-American friends), Disney's forthcoming animated feature due March 4. An ongoing New Years celebration (which of course is called "Zoo Year's Eve") will culminate with a new trailer (which is referred to as a "gnu" trailer, obviously) being released soon. The last trailer wasn't received particularly well by furries at first, but was met with near universal approval from non-furries when played in front of Star Wars: The Force Awakens. Update 1/5/16: Sorry, folks, preview's over. Have a placeholder image for now.